Parmesan Brussels Sprouts are THE BEST ever! They're a super easy to make side dish that will make a brussels sprouts fan out of anyone. Calling all brussels sprouts haters. Yes, you. I need you here cause these parmesan brussels sprouts are about to change the way you think about baby cabbages. 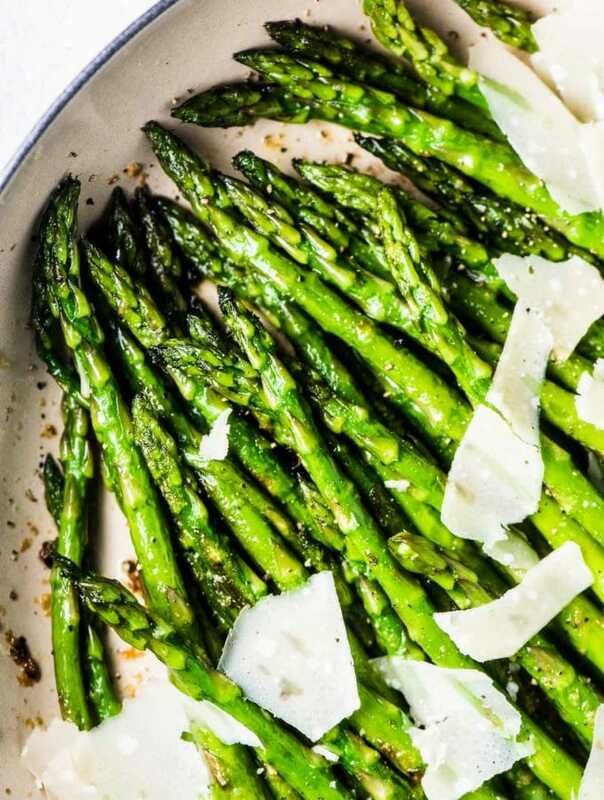 When I served these with dinner the other night, my 2-year-old daughter refused to eat anything on her plate EXCEPT these cheesy brussels sprouts. They're basically magic brussels sprouts. And brussels sprouts lovers, you're going to want to stick around. 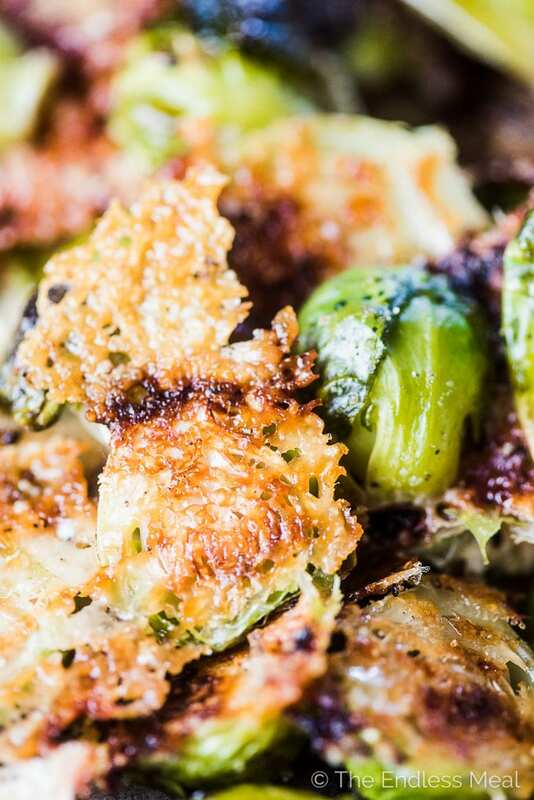 Parmesan roasted brussels sprouts are THE BEST brussels ever ever ever. ← no exaggeration! This cheesy brussels sprouts recipe is the easiest ever. If you can grate cheese and cut brussels in half then you can make this. It is a 5 ingredient side dish recipe – and two of those ingredients are salt and pepper. So simple! 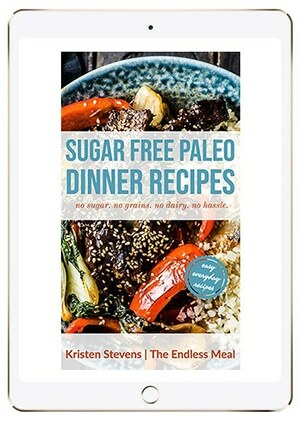 It is a gluten-free and low carb recipe that's totally worth raving about. Do you see that up there? I can barely stand how delicious these little cheesy nuggets are. Please please please promise me that you'll make them! Cover your baking sheet in parchment paper. This is SUPER important! 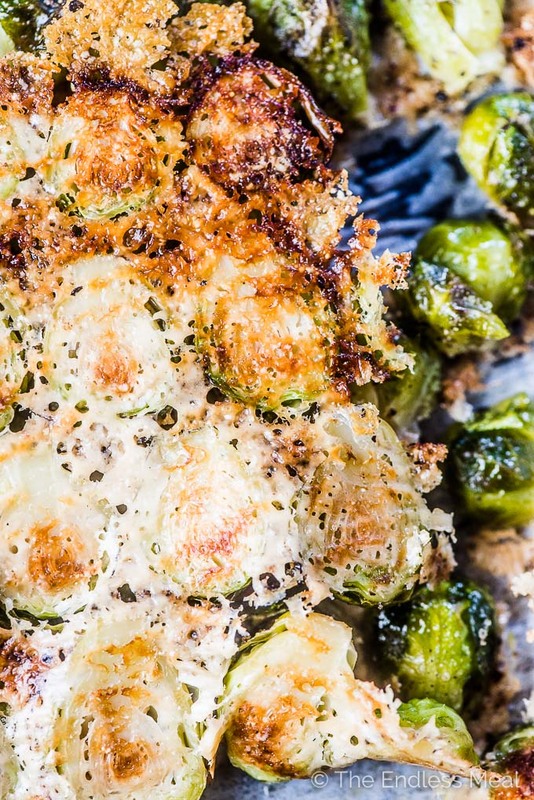 If you skip this, you risk the parmesan sticking to your pan instead of the brussels sprouts. There aren't enough sad faced emojis in this world to describe how terrible that would be. Then cover the parchment paper in a blanket of parmesan cheese. You don't need to get too crazy with the cheese (although if you want to, go for it!) but you do want enough parmesan to lightly cover the whole pan. Next, you'll take your brussels sprouts (cut in half) and nestle then like sardines on the pan. You want to cozy them up as close to each other as they can get. Are Parmesan Brussels Sprouts Vegetarian? I've put this recipe in the vegetarian category because when I was a vegetarian (for 14 years!) I totally would have eaten these. But maybe I was a bad vegetarian. The truth is, parmesan cheese is made with rennet, an animal product that helps separate the cuds from the whey during the cheese making process. So technically, parmesan cheese is not vegetarian. You can call in the vegetarian police if you must, but I know so many vegetarians who eat parmesan that I'm calling these parmesan crusted brussels sprouts vegetarian. What kind of parmesan cheese should you use? The real kind! You know that stuff that comes in a shaker bottle that says parmesan on the label but doesn't look or taste anything like parmesan cheese? Ya, don't use that. Buy a brick of parmesan and use the small holes on your grater to grate it. I buy my parmesan cheese at Costco. It's inexpensive and lasts nearly forever in your fridge so you can always have some on hand for when you get your next parmesan brussels spouts craving. 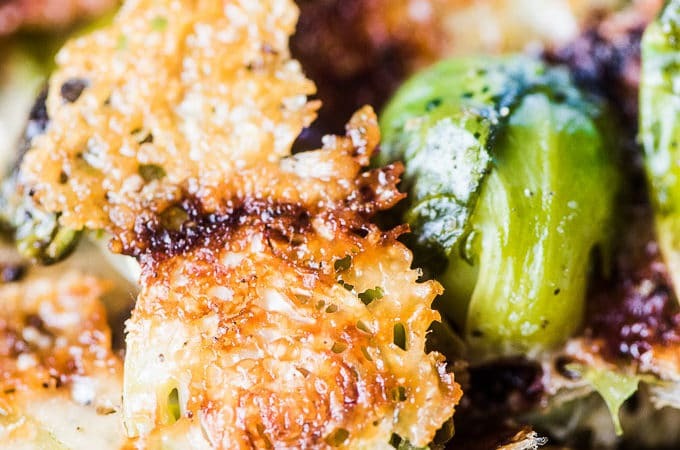 We all need a recipe for cheesy brussels sprouts. I've tried several and I can tell you from experience that baked brussels sprouts with parmesan cheese are the best. 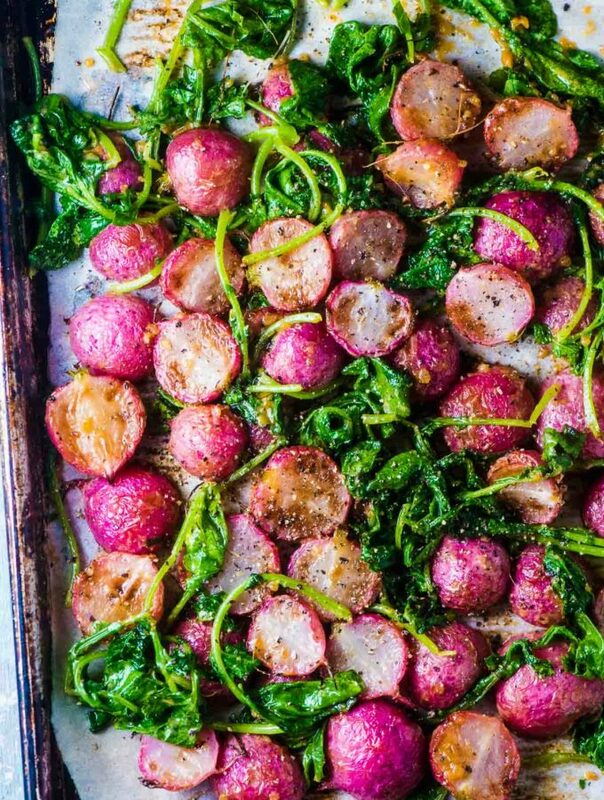 They're super easy to make as a weekday side dish but pretty enough to serve for company. You'll want to keep this in your back pocket for all the brussels sprouts dinners coming up. I'm looking at you Thanksgiving/Friendsgiving/Christmas! You could also take this recipe in a different direction and serve it as an appetizer. The little cheese covered baby cabbages make perfect bite-sized snacks. With only 10 minutes (of very do ahead-able) prep, parmesan crusted brussels sprouts are a perfect side for your dinner party. 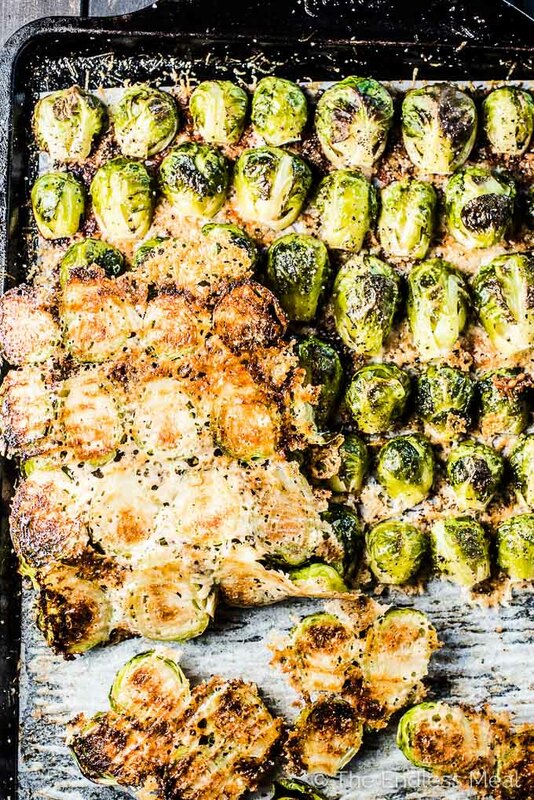 Prep the brussels and lay them on your parmesan covered baking sheet. Now cover them with plastic wrap and pop them into your fridge. When you pull the turkey/nut roast/main dish out of the oven, pop these in. These parmesan brussels sprouts will be ready to serve by the time your turkey rests and has been carved. It's perfect timing! 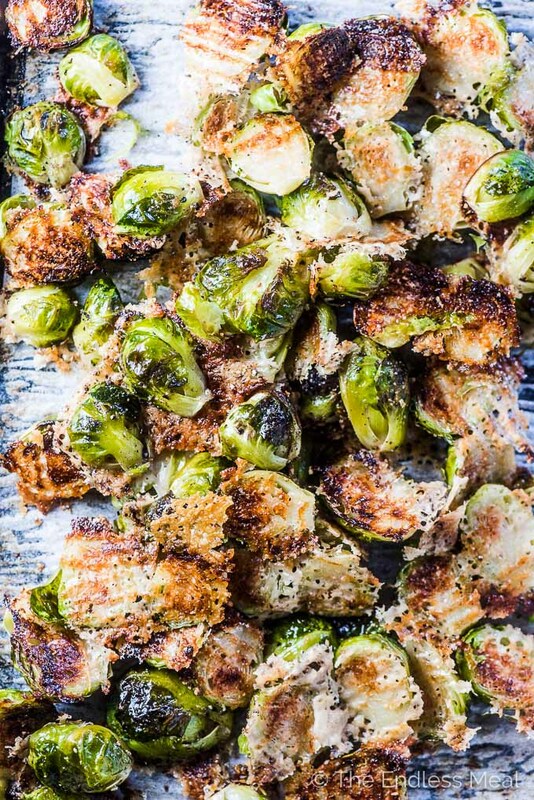 Coconut Oil Fried Brussels Sprouts with Garlic, Chili, and Lime ← My personal fav recipe! Coat the parchment paper with a few sprays of olive oil. Sprinkle the parmesan cheese evenly over the parchment paper. 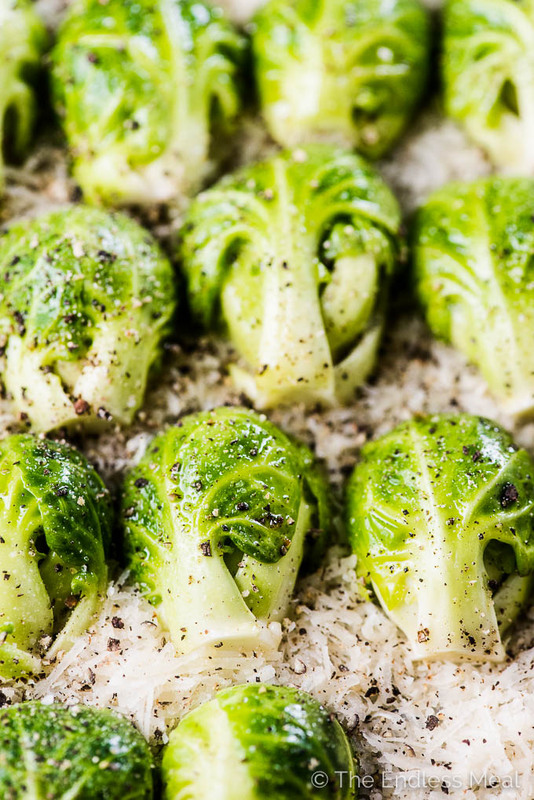 Place the brussels sprouts in rows on the parmesan cheese, cut side down, pressing on each one a little to stick it to the cheese. Bake the brussels for 20 minutes then let them sit on the counter for 2 minutes before pulling them off the parchment paper. I find it's easiest to cover the pan with oil by using olive oil spray. If you don't have any on hand, you can brush the oil onto the parchment paper. Did you use frozen Brussel Sprouts or the ones you cut off a long stem? Disappointed, was really excited to try these, but unfortunately fell short of my expectations. Kind of bland. Did you salt them? They definitely need the salt to make the flavor pop! This is absolutely amazing!! Just made it and no way is it making it to meal!! The husband and I ate 1/2 the pan wen we took them out of the oven!!! Hahaha I love it! That’s pretty much what happened the first time I made these, too! Delish!!!!! 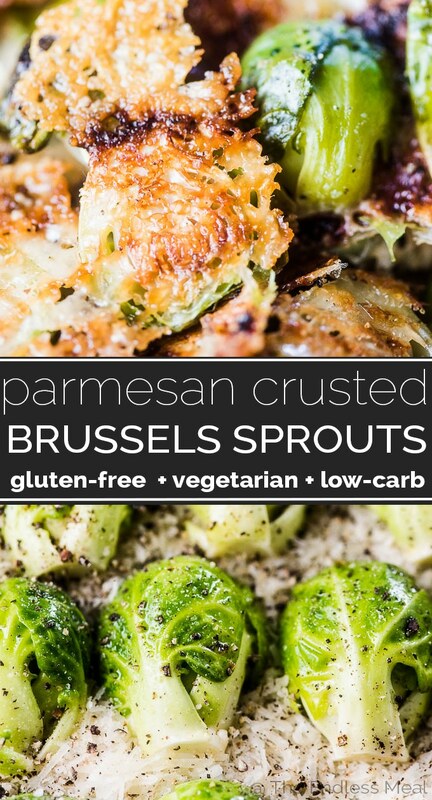 Made them tonight and this is my new favorite way to make Brussel sprouts. These were delish! Thanks so much for sharing! Would you mind listing the macros for these? I’d so appreciate it! This looks wonderful. How many grams of fiber per serving, so I can figure out net carbs. Thank you! I made these for dinner last night and they are amazing. I only wish I had made more. Even my two teenagers went back for seconds! Such a great sign when the kids go back for more! These brussel sprouts are fantastic tasting and so easy to make, I used grated Asiago and they were so good. I prepared these even though I had to guess at the oven temperature because it wasn’t given. I’m sorry, but I thought they were mediocre at best. The oven temp is listed in the first line. It’s 400 degrees. I’m sorry to hear you didn’t like them as much as we do! They’re seriously so freaking good! !